Middle aged (does 55 count as middle aged still?) South African born, Scottish (both parents from Aberdeenshire) Australian runner now living in Helensburgh, Scotland (it’s a long story). 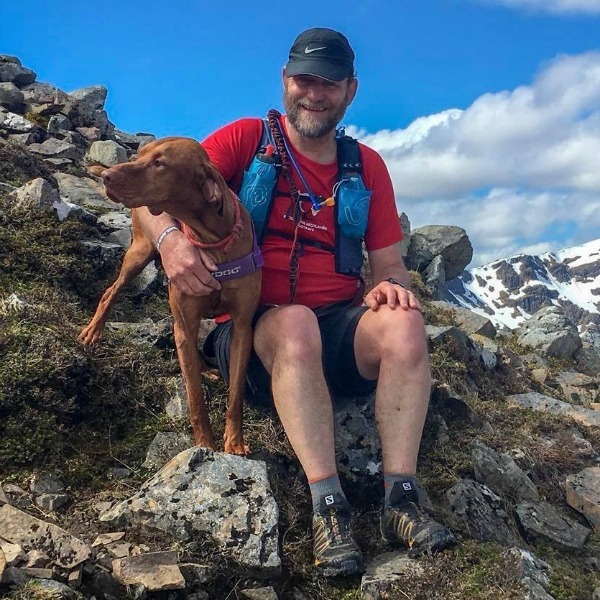 Passions are family (partner Susan, son Ruairidh and four legged running buddy, Umo), trail/ultra running, sailing and geology. Started running last century when in my late teens (mainly cross country stuff) while at Rhodes University in Grahamstown, South Africa. I was drawn into the ultra marathon road running game with the now iconic Comrades Marathon (ran twice, one “up” run and one “down” run), and the Two Oceans Marathon road ultras. I once ran a 2:48 road marathon (I think it was the inter-varsity games race in East London, South Africa in 1992? ), but now struggle to make break 4:00 J. Resurrected my passion for running long distances in 2011 after a few decades “down time” and now am just ecstatic to be able to run the magically beautiful Scottish hills/trails and enjoy the camaraderie and friendliness of the Scottish ultra running community. Having helped as a volunteer for the WHWR last year and run “The Fling” four times now, and “The Devil” twice, entering the ballot for a West Highland Way Race place was inevitable…wasn’t it? So I am absolutely delighted and terrified in equal measure to be fortunate to have a place in this year’s race…and I hope I can do it justice. To manage and overcome the inevitable downs, and to thoroughly enjoy and revel in the ups (hoping there’ll be more of these!) during the race, and all being well, the finish J.